Rita moved to Burgerburgh shortly after winning a job at Papa’s Burgeria. Rita works tirelessly all day behind the counter with her co-worker and friend, Marty. With her trusty Flipper 5000, Rita can craft the most delicious burgers around town. 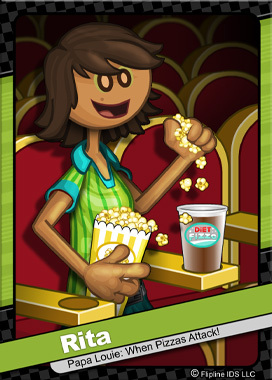 On her few days off, Rita loves watching the latest blockbuster movie at the Sugarplex Theater.